Avid Gallery is a recent addition to our list of galleries representing studio jewelers. It’s new to us, but has been around for many years. The new owner, Judith Carswell, gives us a bit of its history and her thoughts on the gallery and contemporary jewelry. New Zealand is emerging as a strong presence and contributing to the development of contemporary jewelry as a specific market, so it’s wonderful to know something about one of the people who is making that happen. Susan Cummins: Can you give us a little bit of the history of the gallery? I understand that you are the third owner. Was it a gallery devoted to jewelry and objects when you took over? Judith Carswell: Avid is one of New Zealand’s longest-running contemporary jewelry galleries and has become something of an institution for Wellington art lovers since it first opened in 1992. 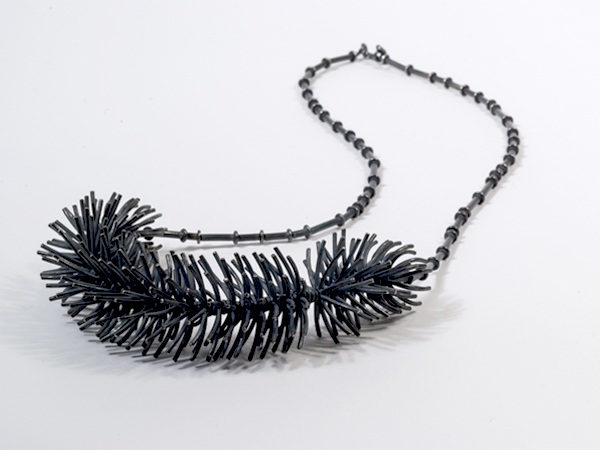 Since its inception, the gallery has represented and exhibited both jewelry and object artists. When Avid was first established 24 years ago, contemporary art jewelry was just beginning to find its feet in New Zealand, so in many ways the gallery and the art it showcases have grown up together. With a large and loyal client base built up over so many years, personal relationships have been fundamental to the gallery’s success. When my husband and I bought Avid early last year, it was only the second time in three decades that the gallery had changed hands. Since you were originally educated in the fine arts, what drew you to jewelry? Judith Carswell: Jewelry has always been an important part of my life and I’ve always been attracted to jewelry making and working with metal. I grew up in a family that placed a great deal of value on the lasting significance of jewelry. Much-loved family jewelry collected over hundreds of years was handed down through the generations and special milestones and celebrations in our lives were often marked by gifts of jewelry. I studied fine art, majoring in painting at the Canberra School of Art in the late 70s (now part of the Australian National University). Unfortunately, the gold- and silversmithing workshop wasn’t established at the School of Art until about the time I graduated—otherwise my life might have taken a completely different direction! But my interest in working with metal persisted and was rekindled after art school—perhaps surprisingly—by my love of horses and riding. I was spending a lot of my spare time breaking in horses, and shoeing was a big part of that. I learned to shoe and the whole process of forging, hammering, and shaping metal was something I found quite mesmerizing. When I came to live in New Zealand in 2004 and my children had finished school, I took the opportunity to do what I would have loved to have done back in the 70s and completed a postgraduate qualification in jewelry design at Whitireia, a tertiary institute of technology here in Wellington. And why own a gallery? Judith Carswell: It was serendipity, really. Owning a gallery was not something I’d ever actively considered. My husband and I had been part of that loyal Avid client base since we first arrived in Wellington and really loved the gallery. When Peter finished his ten-year term as chief executive of New Zealand’s national public service broadcaster, we were contemplating whether to remain in Wellington or move back overseas. When the previous owner told us she was thinking of retiring, it seemed like the perfect opportunity to combine our love of contemporary art and jewelry with a passion to support and nurture young artists, which I developed over many years as an art educator in Australia. Why do you only show New Zealand jewelers? Judith Carswell: There are so many fine contemporary jewelers in New Zealand; there’s no real need to look too far afield. We believe in supporting New Zealand artists and we’ve made it our policy to focus on home-grown talent. While our formal representation is confined to New Zealand artists, that’s not to say that we don’t also want to show New Zealand audiences the best the world has to offer. We’re planning a number of exhibitions, which will feature the work of international jewelers—some of which will be closely tied to contemporary art practice in New Zealand. In September of this year, for example, we’ll be hosting a group exhibition based on the innovative Handshake project, which has been running in New Zealand for the past couple of years. In this project, emerging young New Zealand jewelry artists are paired with some of the world’s best jewelers, who act as mentors to help them develop their work. Our Handshake exhibition will feature the best work from the emerging artists alongside jewelry that has inspired them from 10 major artists from different parts of the world. What do you think makes New Zealand jewelry so unique and compelling? Judith Carswell: New Zealand is a young country in every sense of the word. Human occupation is relatively recent in historical terms, and there are constant reminders that, geologically, the two major islands are still evolving. Earthquakes, geothermal activity, and active volcanoes are a fact of everyday life for New Zealanders. The powerful presence of this ever-changing natural environment and the geographic isolation of New Zealand combine to give its artists a strong sense of place and a youthful energy not often seen in other parts of the world. While being physically cut off from the rest of the world undoubtedly has its downsides, this distance still provides an opportunity to incubate distinctively New Zealand ideas without being swamped by global influences. Nature is a major artistic influence for New Zealand artists, and you can often see the landscape, the sea, and the country’s unique flora and fauna reflected in the work that’s produced. You show some of the well-established jewelers, like Warwick Freeman and Alan Preston, but who do you see coming along as young artists who will make their mark? Judith Carswell: Pioneering artists like Warwick and Alan did a wonderful job creating an appreciation of contemporary jewelry in New Zealand, and in doing that they’ve made life much easier for the many talented jewelers who’ve followed in their footsteps. Frances Stachl produces some outstanding and very innovative work and is rapidly growing in stature as one of the country’s significant jewelry artists. Other emerging artists to watch out for include Debbie Adamson, Kelly McDonald, and Becky Bliss, whose metal brooch work earned her many admirers at this year’s Schmuck exhibition in Munich. Who supports the gallery for the most part? Do your clients think of themselves mainly as collectors, or as consumers? Judith Carswell: Avid’s client base is wide and varied, with both dedicated collectors and people who simply love contemporary jewelry and wearable art. We have many clients who’ve been with us since the gallery first opened, and we’re now starting to see new generations of the same families becoming regular visitors. A lot of our artwork also finds its way overseas. Kiwis are great supporters of their own artists, and distinctive contemporary jewelry is a favorite for many New Zealanders choosing gifts when they’re traveling overseas. New Zealand also has one of the largest diasporas in the world, with about 20 percent of the population living abroad. Many of our clients are now based overseas but still stay in regular contact. When asked to describe to someone what you show in the gallery—how do you describe contemporary jewelry? Judith Carswell: The contemporary jewelry we showcase at Avid is the antithesis of the type of mass-produced work you’d find in the major retail jewelry outlets. Each piece we choose is hand crafted and distinctively different, making it unique to the wearer. The work is conceptually driven and forms a work of art in its own right. At its very simplest, we believe that the true value of contemporary jewelry is in its artistic merit rather than simply the cost of its raw components. What do you see as the future of this particular kind of jewelry? Judith Carswell: We’d like to think that contemporary art in all its forms has a strong future. In recent years there certainly seems to have been a push back against generic mass-production and mindless consumerism for its own sake. Many of the people we talk to at Avid want to know the stories of the work and the artist who made it. They’re interested in exploring the concepts behind a piece of jewelry and what makes that jewelry a unique work of art.